After getting a huge demand for a module concentrating only on image-based questions, PrepLadder is pleased to announce its last pack for 2018- The NBE Snapshot. With limited time remaining for NEET PG, this is the time to revise all the image based questions that can appear in the exam, keeping this in mind we have constructed the NBE Snapshot pack. 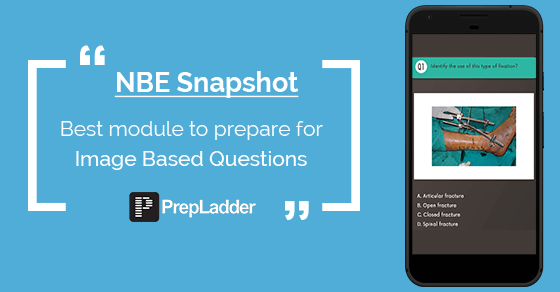 NBE Snapshot is the finest module to give an edge to your preparation at this crucial time. *It will be absolutely free for all PrepLadder Video Pack subscribers. Registrations now open for NBE Snapshot. First 1,000 candidates can avail flat 25% off + 5% CashBack. Click here to avail the inaugural offer. We hope that this effort helps you gain an edge in NEET PG.